I am a huge fan of all things purple. I think the color is vibrant and cheerful and it’s also the color of royalty according to some sources, so it has that going for it. But as much as I love purple I had not found many cakes featuring the color until now. And I have to tell you, I’m loving this cake and its understated elegance. The cake itself is simple and pretty with the square tiers (such a fan of this shape!) and smooth white icing. But the ribbon around each tier takes the cake to another level of beauty, adding to the clean lines of the design. The designer could have stopped with the plum colored ribbon and the cake would have been simple and pretty. But the addition of the bright purple blooms adds just enough pop of color to make the cake stunning. And if purple isn’t your color (it’s OK, not everyone loves purple like I do) you could recreate this design with deep red flowers or even brightly colored blooms to celebrate a spring wedding. 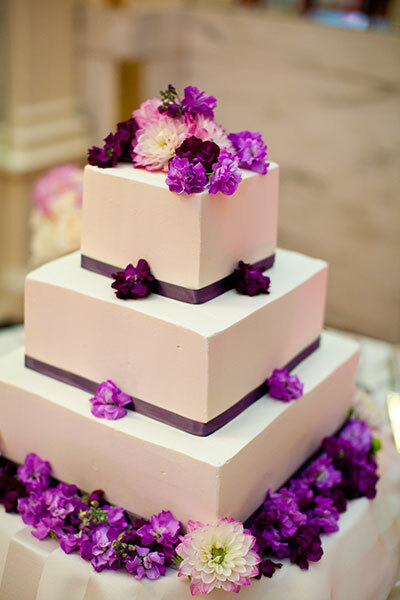 No matter the color of flowers you pick, this cake would be a stunner at your spring or summer wedding.